This is the thirty-sixth in a series of reviews dedicated to the concept of 32Ohm Audio as embodied by the store of that name in downtown Portland/Oregon and described here - Ed. This review first appeared in the March 2011 issue of hi-end hifi magazine High Fidelity of Poland. 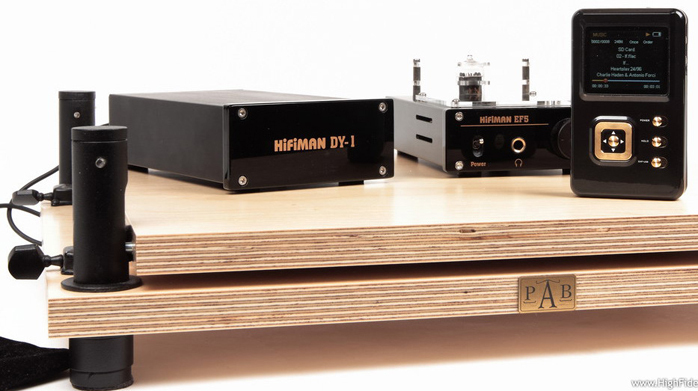 You can also read this review of the HifiMan system in its original Polish version. We publish its English translation in a mutual syndication arrangement with publisher Wojciech Pacula. As is customary for our own reviews, the writer's signature at review's end shows an e-mail address should you have questions or wish to send feedback. 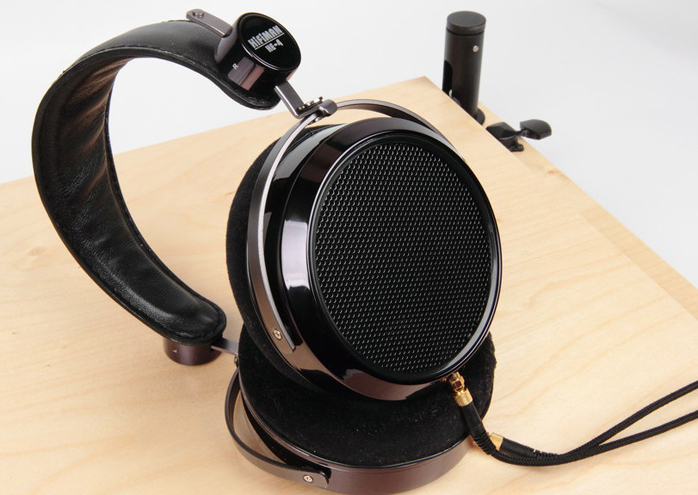 All images contained in this review are the property of High Fidelity orHifiMan - Ed. The name Head Direct Corporation is nearly self explanatory as a company that deals only in headphones and related electronics. It also owns the HiFiMan brand. 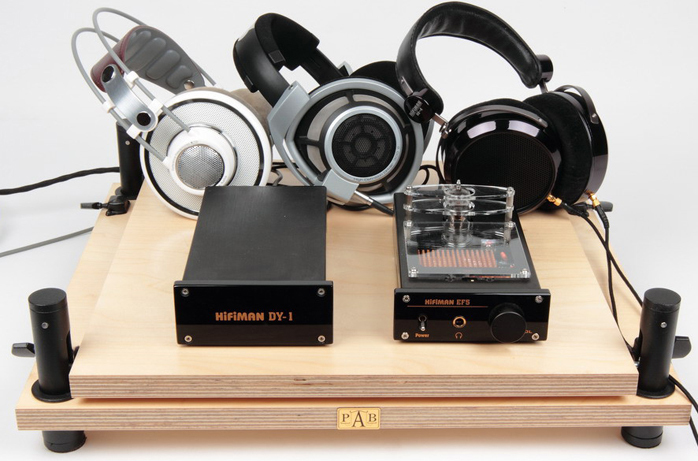 For this review we received their HE-4 headphones, not the top of the line model but sporting many solutions which trickled down from their most expensive HE-6 flagship. We also received their headphone amp, the very nice two-box EF-5 with external DY-1 power supply. It sports a tube input and is capable of driving even very difficult loads like all orthodynamic HifiMan models. These are planar-magnetic designs and as such similar to magnetostatic speakers. They feature quite low sensitivity so not all headphone amps may apply. To deal with that HiFiMan’s own amplifier offers high gain. In Stax speak these are true earspeakers and perform as though one wore miniature planar speakers like Magnepans on the head. To complete the review system the final piece of today’s puzzle was a new source. This manufacturer has already won the hearts of many non-mainstream customers with their HM-801 portable player. It is a quite a big machine featuring the legendary PCM1704 DAC chips and sports a removable head-amp module which allows swapping in one from a different company. 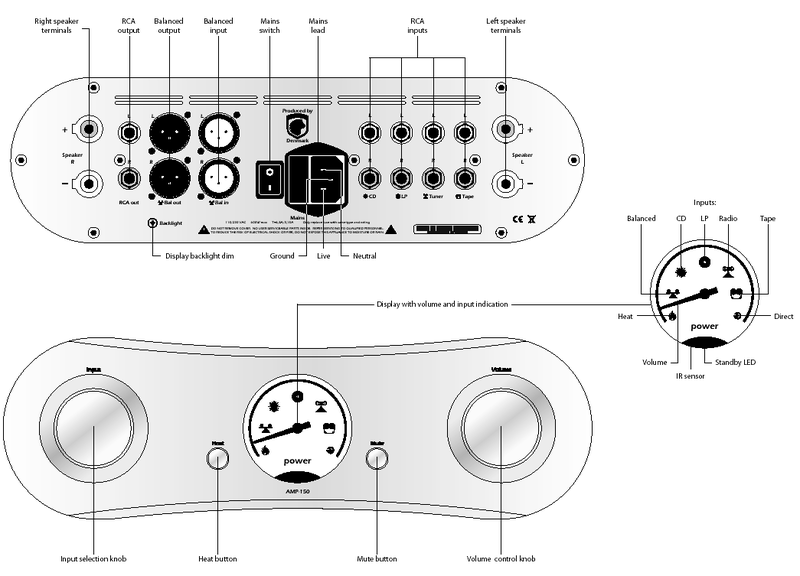 HiFiMan provides customers with schematics encouraging them to experiment and realize their own favored solution. That’s a quite different approach. Although smaller in size the review model has been designed equally well if not better. It champions the TDA1543 Philips non-oversampling chip with upsampling defeated and only a very simple low-pass reconstruction filter. Brilliant. The downside to this solution is a sampling frequency limit of 96kHz. This player relies on SD cards for external memory and plays back MP3 and FLAC files with resolution up to 24/96. It features a large color display but won't show album covers as there is no operating system or microprocessor on board. The internal memory is limited to 16GB (small if you consider how big hi-rez files can be). This device can also operate as a standalone D/A converter via its mini-USB input to accept streaming PC signal. For this review I thus had a complete system on hand whose signal from the mini output jack of the player progressed via iChord cable from The Chord Company to the headphone amp which drove the ear speakers. For evaluation I used this combo as is, then broke it down into its three constituents. That made the results more interesting yet. ...Harry Belafonte, Belafonte at Carnegie Hall, RCA/Sony Music, 7783322, LPCD-M2 Mastering, No. 0953, HQCD; Helge Lien Trio Hello Troll, Ozella Music, OZ021CD, FLAC 24/96; Jeri Southern, The Southern Style, Decca/Universal Music Japan, UCCU-9643, SHM-CD; Jim Hall, Live!, Horizon/A&M Records/Universal Music Japan, UCCM-9225, CD; John Abercrombi & Eddie Gomez, Structures, HDTracks, FLAC 24/96; John Coltrane, Blue Train, Blue Note/Classic Records, HDAD 2010, DVD-V 24/96 + DVD-A 24/192 + FLAC; Linda Ronstadt, What’s New, Elektra/Lasting Impression Music, LIM PA 046, gold-CD; Maria Peszek, Miasto Mania, Kayax, 007, CD; Norah Jones, …Featuring, Blue Note, 09868 2, CD; Recoil, SubHuman, Mute, LCDStumm279, CD+DVD 24/44,1; Santana, Abraxas, Columbia/Mobile Fidelity, Collectors Edition, No. 06452, UDCD 775, gold CD; Stan Getz & Joao Gilberto, Getz/Gilberto, Verve, 24/96 FLAC; Suzanne Vega, Close-Up, Vol 1. Love Songs, Amanuensis Productions/Cooking Vinyl, COOKCD521, CD; Zbigniew Namysłowski, Open, Polish Jazz, vol. 74, SX2539, master, 16/44.1, 24/96 WAV.